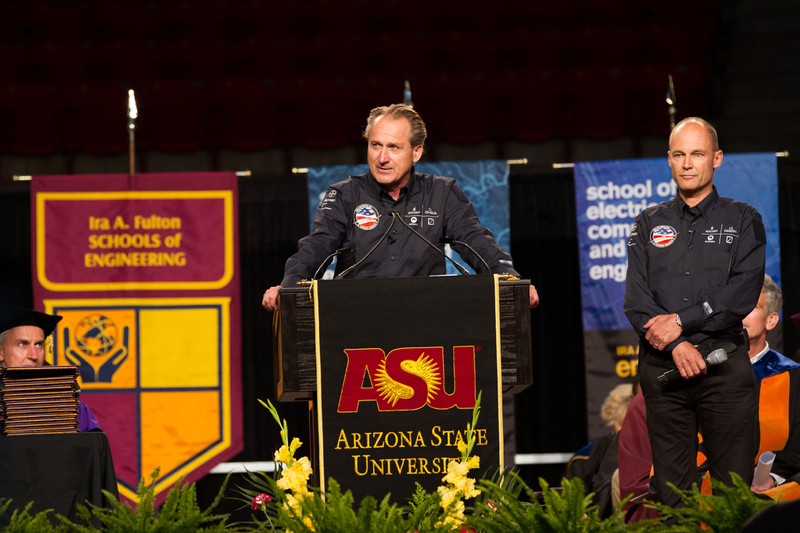 Bertrand Piccard and André Borschberg, pilots of the Solar Impulse, made a surprise visit at the May 9 Fulton Engineering convocation. They encouraged the class of 2013 to go beyond knowledge and embrace a pioneering spirit to affect change in the world. The two are themselves pioneers. Piccard, a doctor, psychiatrist and aeronaut, made the first nonstop around-the-world balloon flight. Borschberg is an engineer and graduate in management science, a fighter pilot and professional airplane and helicopter pilot. The team landed in Phoenix earlier in the week in their first leg of a coast-to-coast flight in the first plane to fly day and night only on solar power. While the primary goal is to show the potential for clean energy and future aviation applications, the pair hopes to also inspire broader interest in exploration and innovation. In addition to Phoenix, they will be making stops in Dallas, St. Louis and Washington D.C. before a final landing in New York. The ultimate goal is an around-the-world flight in 2015. 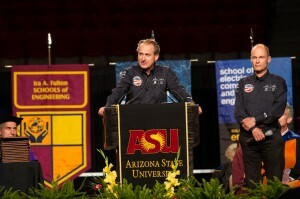 A video of Piccard and Borschberg’s message to Fulton Engineering students, as well as more information on their venture, is posted on the Solar Impulse website.